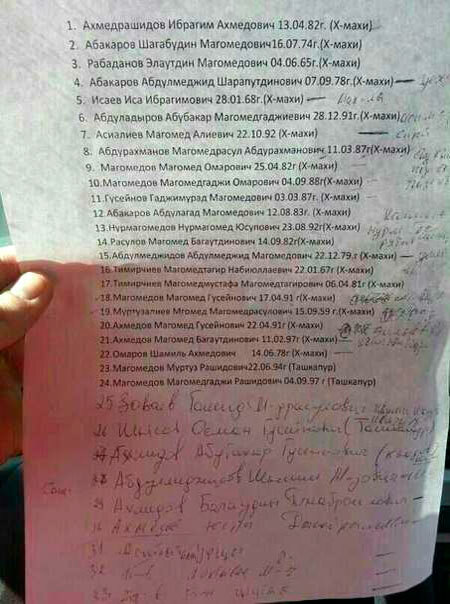 A KGB hit list of doomed Muslims has been distributed in Dagestan. A photo of the hit list for the Salafi Muslim village of Khadzhalmakhi has been posted on the Internet. 3 Muslims from this list have been murdered, and a forth one is in intensive care unit of a hospital. Muslims begin to leave the village for fear for their lives. Abdulmazhid Abdulmazhidov, as well as father and son Akhmedovs were in the list under numbers 28, 29, 30, and now they martyred, shot dead. Names from the list are deleted only under condition, if Muslims deliver themselves to infidels “with repentance”.